It’s about time we brought out a new healthy cake. The snickers was good, the mars bar was great but the healthy Gaytime cake? We have a feeling it’s the epicest YET! Ok, ok, we know they’re all epic but whatever… you’re gonna go crazy for this cake. Gaytime ice creams were definitely one of our faves as kids. They remind us of Manuka pool (where our Canberra peeps at? ), we’d go there all summer long and get an ice cream as a treat. Sometimes it was a splice (um hello refreshing) but most times it was a Golden Gaytime. Or a rainbow paddle pop, seriously… icecream. Actually, icecream used to be Carla’s favourite food. Not anymore. Probably this Healthy Gaytime Cake takes the top spot. For the moment anyway… until we bring out another epic healthy cake. 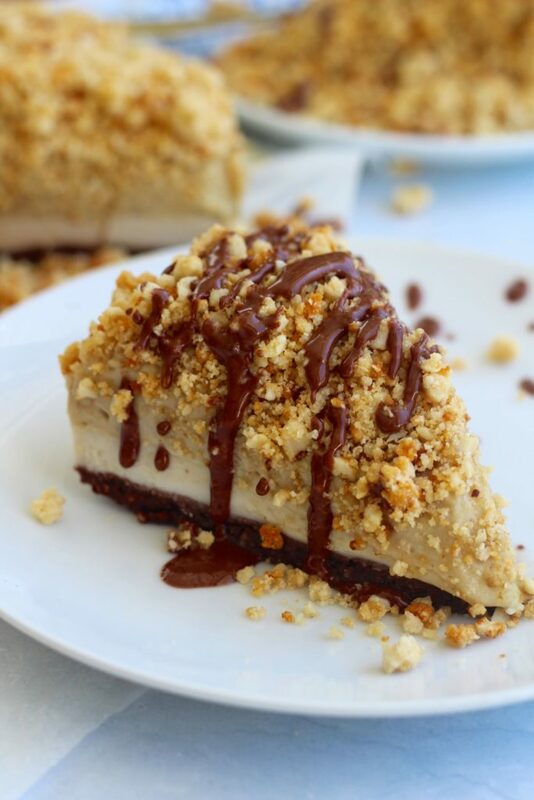 So this cake isn’t raw… because we baked the cookie crumble and the baked cookie crumble is so freaking delish, even by itself (you may want to make extra)… BUT it is sugar free, gluten free, dairy free and grain free. Yep it’s #paleo and #vegan. Ha! But you can’t eat the whole cake, ok? We don’t recommend that. 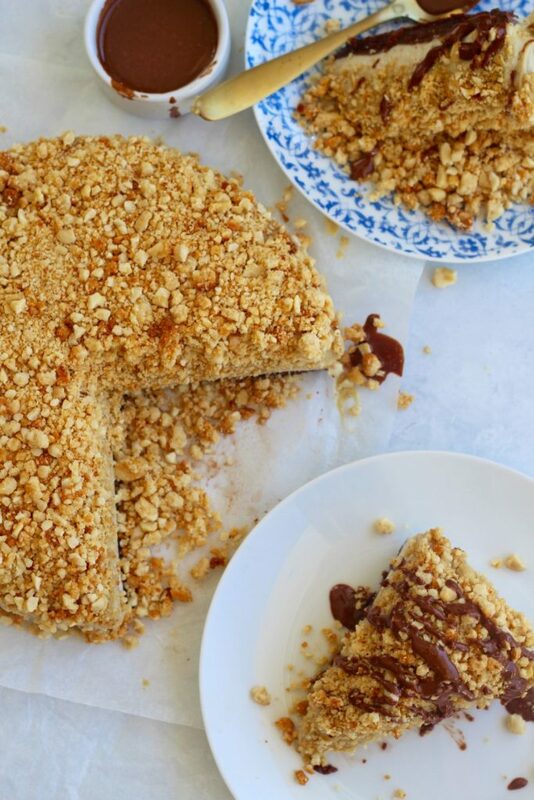 We do however recommend you make this awesome healthy Gaytime cake… slice it up and enjoy it with your favourite people! Choose carefully, this cake makes you magical, so you’ll want to select your 15 fave people to enjoy this cake with… OR you can freeze it and enjoy a slice whenever dessert o’clock kicks in. Like is that… now? If you DO make this cake… share it on social with us, #GetMerry or post it to our free Facebook group! We seriously LOVE drooling over your photos and giving them loads of love (we re-share our faves!). 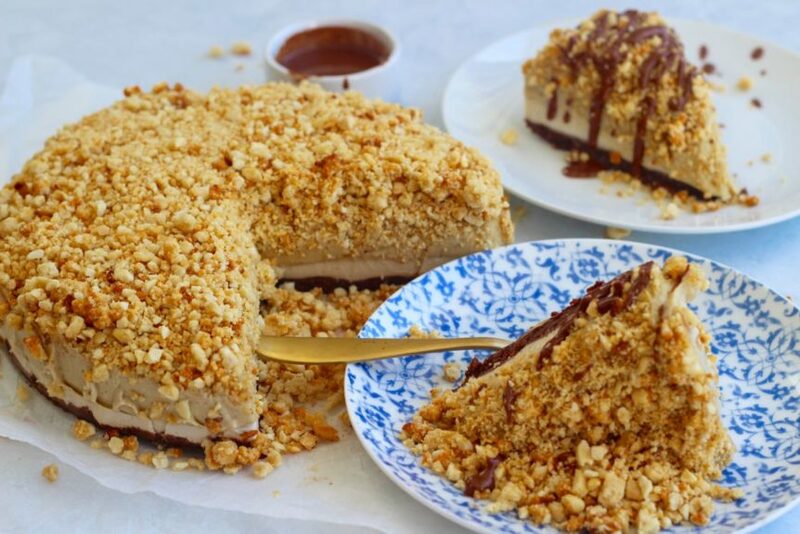 Yay for healthy Gaytime cake… and yes… we’ve re-titled it Merrytime cake. Yay for healthy Merrytime cake! p.s have you got your hands on our FREE 7 Day Meal Plan yet? It’s a downloadable PDF with 15 epic recipes, shopping list and prep tips to get you super dooper organised! Click here to grab a copy! Line a 24 cm (10 inch) spring form cake tin with baking paper. Start with the biscuit topping, you can even make this the day before and spread out the cake making experience. In a large mixing bowl place the cashew crumbs, almond meal, coconut flour and mix together. In a small saucepan (or you can use your microwave) melt the coconut oil, honey and vanilla together. Take the saucepan off the heat and add the baking powder and water, stir together until it foams and turns a white-ish colour. Pour this in to the dry ingredients and mix well until combined. Spread the mixture onto the prepare tray in a thin layer and place into the oven for 5 minutes. Mix it around and place back into the oven for another 5 minutes. You want it to be golden, so if it needs a bit longer, place back into the oven and watch carefully until you see golden crumbs of deliciousness. Allow to cool completely. They will go yummy and crunchy. Ok next! Place all the base ingredients in to a food processor or blender. Whiz until well combined, it will become almost a smooth choccy butter. Yum! Drain and rinse the cashews and place them in to a food processor/blender along with the coconut milk, coconut oil, honey, tahini, vanilla and salt (not the dates). Pour 1 and 1/2 cups of the mixture on top of the base and place back in to the freezer for at least 10 minutes. Now drain the dates and add them to the remaining filling mixture in the blender/processor and whiz again until combined. Pour the toffee/caramel filling on top of the vanilla layer, then evenly sprinkle all the biscuit crunchy bits on top and lightly press them into the filling. Place into the freezer for at least 2 hours or until set. Cut in to slices with a hot knife and enjoy! Oh and drizzle with melted sugar free chocolate if you like! Store leftovers in the fridge or freezer and thaw out when you’re ready for a slice of healthy gaytime cake (or merrytime!). This isn't really a 'quick' recipe... but it is easy! All you need to do is slowly follow the steps... you can DO IT! It's worth it! Promise! Also! Be sure to taste the filling before freezing, to check if you need extra sweetener!